In November 1908 the Buffalo County Board of Supervisors adopted bridge plans prepared by the Standard Bridge Company as the county standards. The board awarded an open-ended construction contract to Standard two months later, purchasing numerous small-scale bridges from the Omaha-based company over the next two years. Among the structures built in 1909 was this 80-foot pinned pony truss that replaced an earlier bridge at the Sweetwater Mill. 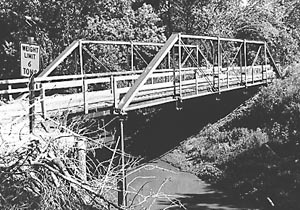 Standard drove new steel foundation piles, fabricated the truss from steel rolled by the Illinois Steel Company, and completed the bridge that year. All but one of the original approach spans have since been filled in, but the Sweetwater Mill Bridge remains otherwise intact. By 1915 Buffalo County had spent years maintaining and repairing the long timber pile bridge over the Platte River southeast of Kearney. Early that year the state engineer's office designed a replacement for the decrepit structure, using its newly developed pin/rigid-connected truss. 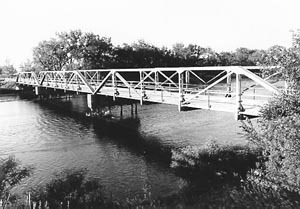 The county board of supervisors then hired the Omaha Structural Steel Works to fabricate and build the new Kilgore Bridge.